After successfully tackling Totoro Rice Crispy treats, I decided to make these cute Hello Kitty treats for my little cousins this Christmas. Here’s the detailed tutorial on how to make them. Thanks to my mother-in-law for snapping some pictures of me while I was making these! Note: Hello Kitty’s nose is actually yellow. If you have access to mini yellow candies of some sort, you can try those. The normal yellow M&Ms were too big, and this supermarket had no yellow alternative, so I stuck with the mini chocolate chips. 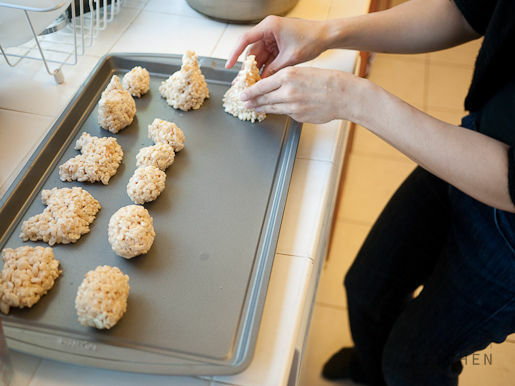 Make rice crispy treats according to the instructions on the package. In this case, I melted 4 T butter with one 10.5 oz package of mini marshmallows. Once melted, add 6 cups of rice crispies cereal and stir until combined. Once it’s combined, work quickly!!! 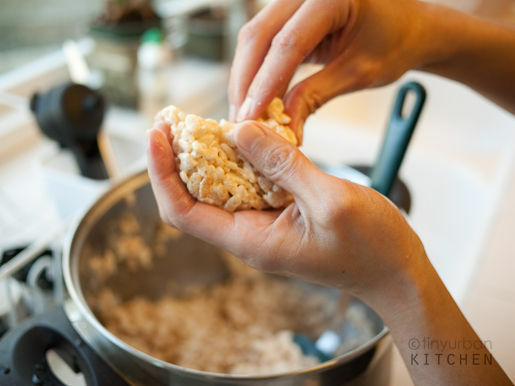 Wet your hands slightly and start shaping the rice crispy mixture into oblong spheres with ears. If you work too slowly, the mixture will cool down and harden, thus become difficult to mold. Instead of shaping the ears, you can also make the egg-like balls first and then attach little ears after the fact. I also made some Totoros, which are essentially cones with 2 ears on top. A finished Totoro pre-chocolate dunking. Once you have shaped the Hello Kitties, add the mini-chocolate chips by ramming them point-first into the “face.” Likewise, press two M&M’s into one side of her head below her ear. I actually think I put the bow on the wrong side, but it doesn’t really matter! Again, this step is easier to do when the mixture is still sort of warm. For the Totoros, you can optionally dunk them in chocolate (see this post for details). Unlike last time, I did not mix the melted chocolate with oil at all. Instead, I just melted the chocolate chips in the microwave (45 seconds – stir – then another 45 seconds), and dunked the Totoros directly. The thick chocolate is a bit harder to handle but the chocolate ends up hardening much more solidly, which I prefer. If you don’t want to form ears, you can use large chocolate chips instead. I dabbed each white chocolate chip into a bit of melted chocolate and attached the ears onto the rice crispy “face”. And that’s it! It’s pretty simple, theoretically. It takes awhile to get used to handling the sticky rice crispy mixture and also the thick chocolate. Once you get the hang of that, though, you can spit these out pretty quickly. Enjoy! Yum yum . . .
sooooo cool!! im definitely going to try making these one day 🙂 thanks! Thanks for putting a smile on my face so early this morning. These are soooo cute! So cute! The m&m’s are great for the bow. Happy Holidays! Have a good time in Vegas! I still can’t get over how cute these are! Thinking of trying them in a different shape for our boys, like robots. Hello Kitty is one of my “Asian” fettishes! Totally in love with these charming little treats! These are soooo cute! I have two college age kids but I still love hello kitty! omg i get hungry.. yummy yummy.. looks delicious and cute. You are very creative!! well done. FYI: If you are making Hello Kitty, her bow must be on our right (looking at her) or her left ear. If you put the bow on her right ear, you are actually making her twin sister, Mimmy. Ha ha, thanks for the info! I had no idea Hello Kitty had a twin sister. I guess I made a lot of Mimmys then! Wow, these hello kitty crispy rice recipe is looking very nice. I will also try these one at my home. Thanks for these post. These are so cute! I might make some for my sister, who loves Hello Kitty. Your blog is great! I have found tons of things I want to try. If you get the chance, please visit my blog, allyoucanchew.blogspot.com. I’m a fairly new blogger, so I’ve been visiting other blogs for ideas, and I would really appreciate the view.